Releasing their third album God Is On The Move in 2015 via BEC Recordings, 7eventh Time Down, the pop/rock quartet from Kentucky, with musical similarities to Building 429, Kutless and Seventh Day Slumber, delivered 11 songs of rick lyrical poignancy and emotion, while also tackling broader issues prevalent to society today. These guys wear their heart on their sleeve, and after being completely overcome and challenged by their sophomore album Just Say Jesus in 2013, friends Mikey, Eric, Cliff and Austin picked up right where they left off, which was definitely a good thing! With God Is On The Move mainly comprising of the theme of God working in our lives all the time even when we can’t see the immediate effects; the BEC Recordings album was, and still is, a must listen for any listener who loves pop/rock music, or even worship music as well. Though some melodies and lyrics were slightly cliché, there’s no denying the band’s heart for Jesus, as we did and still can immerse ourselves and delve deep into 40 minutes of guitar led pop/rock goodness. However…that was then. Now it’s three years later, and with only the lead single on an unnamed album “I Have Decided” being released within that time span; I reckon the new offering is very underwhelming- sad to say. Now let me say as a precursor, that I am not bashing 7eventh Time Down. Not at all. Their full-length albums are pretty good, and you can read my review of their 2015 album, and listen on Spotify– and see for yourself just how professionally recorded and exceptionally sung most, if not all, of their songs are. So why am I bagging “I Have Decided”? Well I guess if you want to pinpoint one thing- it’s just that when you have been reviewing for as long as I have, you tend to pick up on things a lot, especially whether a song is lyrically engaging or not. While you would say a lyrically creative song would be something written by Andrew Peterson, this song falls into the last category. Lazy writing, repetitive lyrics that we’ve all heard before, an overuse of electronics- you name it, and “I Have Decided” has it. This track doesn’t really make me feel confident about the band’s next new album- however I will reserve judgement for the rest of the tracks when they release sometime in 2018 or in 2019. Until then, let me just say this. That I may listen to “I Have Decided” in the near future and be impacted and challenged then- but until such a time, I think I’ll stick to new albums from Phil Wickham and Riley Clemmons (which both released the same day as “I Have Decided”!). 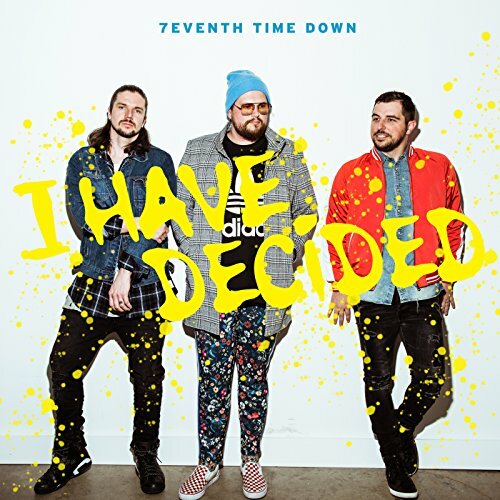 In 2015, 7eventh Time Down previously crafted an album loaded with worshipful moments, as well as thoughtful melodies about the human condition and our place in this world as a Christian. But three years on; “I Have Decided” isn’t that ‘thoughtful melody’ and that is a shame- as the band is super talented, but the talents are wasted here. Arguably one of my favourite artists on BEC Recordings currently (alongside Kutless, All Things New, David Dunn, Matty Mullins and Stephen Christian), these men from Kentucky have not delivered enough in this song to warrant at least a listen. But the fact that these guys still have proven track records is reason enough for us to keep our ears peeled for maybe the next song which is better from them. So, as we wait on the next album, what do you think we should do? Revisit God Is On The Move? Or just binge-listen other artists’ albums? How about both? Note- below are two other albums you will love more than “I Have Decided”! Check these two albums out first!